There will be a non-rated four-round Swiss at the Springfield Barnes & Noble on September 21st and 28th, 2008. You will play two games per night, starting at 8:45 p.m. The time control will be Game/30. Digital clocks are to be set at G/27 + 3 second delay. A player can stop keeping score if his clock goes under 10 minutes. His opponent must continue writing the moves down until he also goes under 10 minutes. There is no entry fee and there are no prizes. To register, send an email to rsherry8@comcast.net no later than Saturday, September 13th. P.S. - This would be a good warm-up for the KCC's Sy Fish Memorial, a USCF-rated G/30 that begins October 2nd! In the battle for 1st place, I overcame a lost position against undefeated (+10-0=6) rival Ian Mangion to finish one-point ahead (14.0 to 13.0). Luck and volume played huge parts in the wire-to-wire success (my first at the KCC); as I collected 4 points from 7 possible defeats and played most games (18). Rounding out the top 5 were : 2005 KST-winner NM Mark Kernighan (10.5), 2006 KST-victor Greg Tomkovich (7.0) and Pat Mazzillo (6.0). Here are the final standings plus 3 of the final-round games (1 annotated) in Java-replay and PGN. 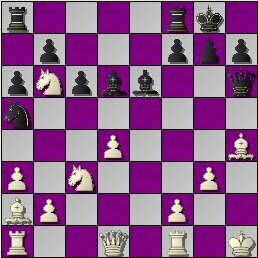 A ChessBase file with all the available games will follow and perhaps some other goodies, too. My opponent resigned after just 13 moves. He had a bad position & said I was taking too much time but STC is short for Slow Time Control. With 2 games to go, I'm at 4.5-2.5. +4 was enough to win in 2005 (the runner-up had 6.0) but won't be this year. Even if Cli2 (currently =3rd) beats hahahaum (he leads with 5.5) this week, I win-out against them & no other contender emerges, the tiebreaks are against me. Anyway, here are the replays & PGN of all my games from the event. My 6th round STC World Championship game was an uphill battle but it ended in a draw. ... and missed a White tactic at turn 15 that left me a piece down for roughly 80-85% compensation. Things got much worse at move 18 when I chose a far-too-slow plan. ...and errored again at move 22 to allow a repetition. In the final position, I was better but too nervous to continue. Here are the replays & PGN of all my games from the event. As it turns out, only the section winners and the ICC runner-up will advance to the finals; not 16. I kept a slim one point lead with a pair of wins against Bert Shiffman. Ian Mangion kept pace by beating Greg Tomkovich twice. NM Mark Kernighan clinched 3rd place with a victory over Don Carrelli. Wayne Burmett & Joe Renna also won. Here are the standings with 1 round to go plus 5 of the above games (2 annotated) in Java-replay and PGN. Sorry for the lateness of this report but I had an STC game to play Friday night & spent most of yesterday analyzing it. You'll see why in the next post. Here are the standings with 2 rounds to go plus all of the above games (4 annotated) in Java-replay and PGN. My 5th game of the 2008 STC World Championship is tonight (Wed. 8/13) at 8:15 p.m. EDT. Afterwards, I'll post the score & a recap. 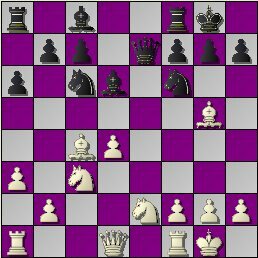 I played a strong game against my opponent's Slav and won in 26 moves. Java-replay and PGN of all my games in the event; including light notes to tonight's victory. ... & practically out of Finals-qualifying contention. 4.5-0.5 the rest of the way probably won't do the job. Here are the replays and PGN of all my games thus far. KCCC U1800 Champ Dr. Ian Mangion remained undefeated (7-0-5) and moved to within a point of 1st place with a 1.5-0.5 match-victory over me. He won the opener to snap my unbeaten streak at 16 tournament games and drew the nightcap. 1. 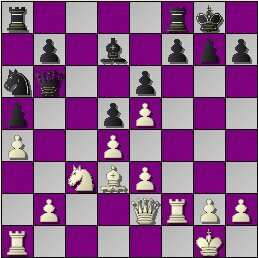 Nf3 Nf6 2. c4 e6 3. Nc3 d5 4. cxd5 exd5 5. d4 Bd6 6. Bg5 c6 7. Qc2 Nbd7 8. 29. Rxd8+ Bxd8 30. Kc2 Bf6 31. b3 Ke7 32. Kd3 Kd6 33. Ke4 a5 34. Ng5 Ke7 35. Kf6 42. Kd6 Kg7 43. Ke6 Kh6 44. Kf7 Kh5 45. Ng5 Be1 46. e4 Bxf2 47. e5 Bxh4 48. 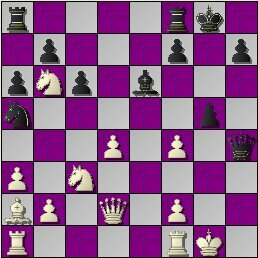 Nf3 f4 49. e6 Bd8 50. Kg7 $4 Kg4 $19 51. Nd4 f3 52. Kxg6 f2 53. Nc2 f1=Q $4 54. In other games, Greg Tomkovich beat Bert Shiffman, Mark Kernighan won vs. Max Sherer and Wayne Burmett took 1.5 points against Pat Mazzillo. Replays, more scores, notes & the full standings will follow. Update 8/8 at 11:00 p.m. - Annotated Java-replay page, zipped PGN file & table uploaded. My 4th game of the 2008 STC World Championship, where I'm currently = 5th-11th, is scheduled for tomorrow (Wed. 8/6) at 10:15 p.m. EDT. The task will be difficult; as my opponent, the highest-rated player in the event, has lost just 14 times (149-14-13) in 176 standard games!! In case the STC/WCL bot fails to collect the PGN & generate the replay, I'll post the score & a recap ASAP. Update Wed. 8/6 @ 8:55 p.m. - White didn't show up, so I claimed a forfeit. I extended my lead to 2 full points by playing a simul but should've lost to Pat Mazzillo. Here are the standings entering the final month of the event plus 5 of the above games (3 annotated) in Java-replay and PGN.